Announcement I love creating keepsakes from your stories. 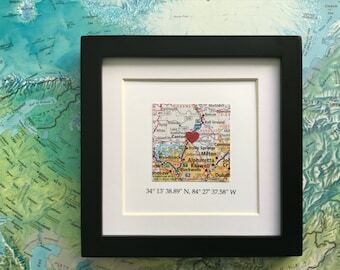 :) Hip Little Squares specializes in custom map art, ticket keeper shadow boxes, and Scrabble tile art. Please read the item description and use the shop sections for easy browsing. Thanks for stopping by! I love creating keepsakes from your stories. :) Hip Little Squares specializes in custom map art, ticket keeper shadow boxes, and Scrabble tile art. Please read the item description and use the shop sections for easy browsing. Thanks for stopping by! I purchase my map as a wedding gift for my manager and she loved it! As for the purchasing experience, it was so fast and wonderful. I’m truly appreciative. Need a little gift in a hurry? Personalized and ready to ship quickly- a best seller! Original watercolors with a little message...for you or a lucky gift recipient! I make everything for my shop in our home. Hip Little Squares has almost taken over the second floor! Your order is packaged with love and care. A few of my favorite things - watercolors, vintage maps, inspiring quotes, bright colors and geometric shapes... I love putting them together to create original, unique gifts that make people smile. Like many Etsy shop owners, I began by making gifts for friends and family members. I wanted to continue with my ideas, so I decided to open a shop. I make everything you see in my home in the beautiful mountains of North Carolina. My Etsy shop brings me a lot of joy and I love connecting with people from all over the world. I'm having a wonderful time! After a career in education, I'm happy to now have even more time to create and to pursue other things I love...traveling with my really fun husband, hiking, poking around in thrift stores, and singing. Thanks for stopping by and for your interest in Hip Little Squares. I'd love to hear from you, so feel free to message me with any questions or comments. Many thanks also for your ongoing social media support - I truly appreciate every pin, share and post! Hello! You can buy with confidence from Hip Little Squares, because I'll do everything possible to make your experience here a happy one.